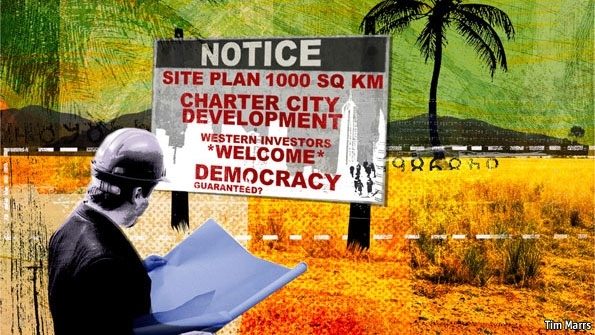 In 02009, economist Paul Romer presented to the Seminars About Long-term Thinking his idea for Charter Cities. Modeled on Hong Kong but stripped of the colonialism (ideally, anyway), Charter Cities are meant to bring the agility and creativity of start-ups to the world of governance. In a nutshell, the Honduran government wants to create what amounts to internal start-ups—quasi-independent city-states that begin with a clean slate and are then overseen by outside experts. They will have their own government, write their own laws, manage their own currency and, eventually, hold their own elections. This year the Honduran legislature has taken the first big steps towards the creation of what it called “special development regions”. It has passed a constitutional amendment making them possible and approved a “constitutional statute” that creates their autonomous legal framework. And democracy will be introduced gradually. Only when the transparency commission deems that the time is ripe will citizens be able to elect the members of the “normative councils”—in effect, local parliaments. This aspect of the plan is just one of those attracting heated criticism. Some find the explicit (if temporary) rejection of democracy repellent. Others detect a whiff of neocolonialism: gimmicks dreamed up in rich countries being foisted on poor ones. These are early, preliminary steps and it will be many years before major changes take hold, but Mr. Romer and others are paying close attention to the implementation. Listen to Mr. Romer’s Long Now Seminar to see why he thinks it can work.